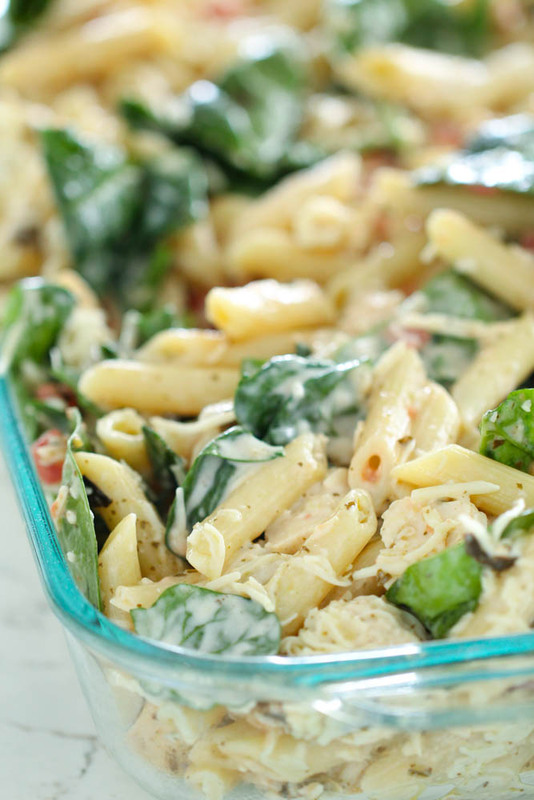 Chicken, tomatoes, spinach, basil pesto, and cheese come together to make this fresh pasta bake. 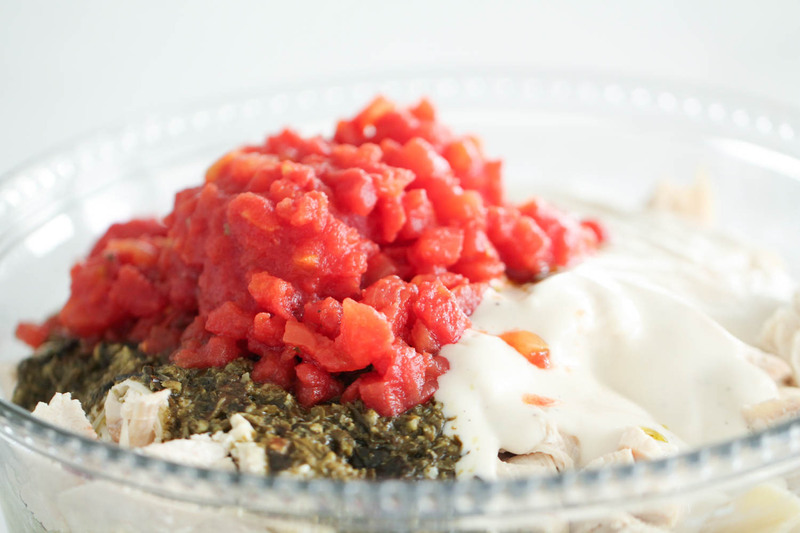 Our Pesto Chicken Casserole is simple to throw together and can be made ahead of time and kept in the fridge until you are ready to bake it for dinner. I love pasta in all its forms! My family would eat spaghetti once a week if I let them, so I thought I would switch up our regular pasta-night dish for a pasta casserole. My husband doesn’t typically like recipes with pesto, but this recipe had just the right amount of it. First, you’ll need to cook your noodles. 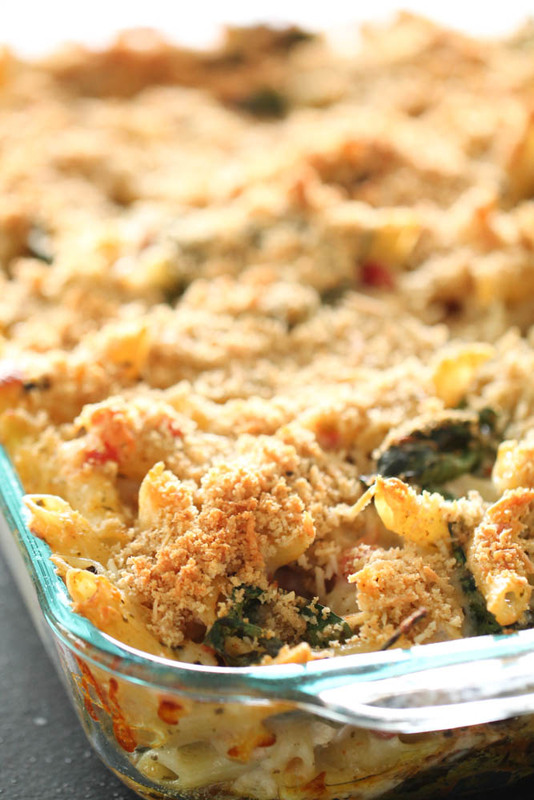 We use penne pasta in this pasta bake, but any kind would work. We’ve tried it with bowtie and our kids loved that too! 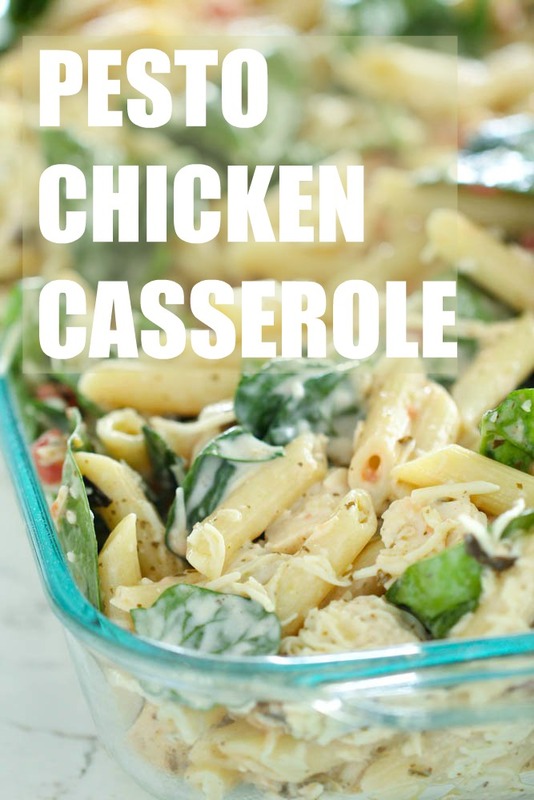 In a large bowl, mix together all of the ingredients listed to assemble the casserole. After you have mixed together the ingredients for the casserole, you spread them in a 9×13-inch baking dish. Next, you sprinkle a delicious, cheesy crumb mixture on top and put it in the oven! 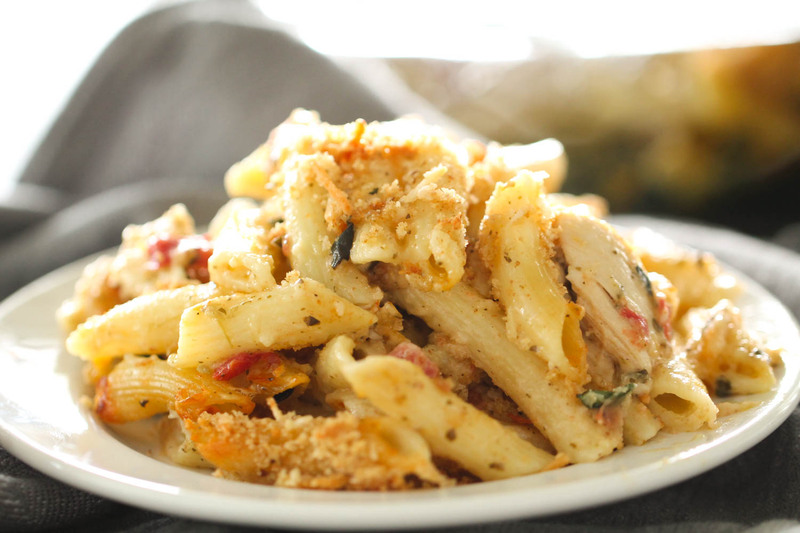 This chicken casserole recipe is extremely simple and takes no time at all to assemble! Used canned goods: This recipe can be simple if you choose to use canned tomatoes, Alfredo, and pesto sauce. It’s almost a dump and go recipe that tastes amazing! However, you can definitely use homemade or your favorite version of any of those mentioned above if you like to use fresher ingredients. Cool Off Your Pasta: Make sure to rinse your pasta off in cold water after you boil it. This will keep it from sticking together when you’re trying to mix it with your other casserole ingredients. Our best advice is to dump your pasta into a straining bowl like this one. And then run cold water over your pasta for 2 minutes. We promise you’ll notice a difference using cooled pasta rather than hot. We couldn’t get enough pesto sauce after trying this recipe, and we’re pretty sure you’ll feel the same way. Here are a few of our favorite pesto recipes, using both homemade and pre-made pesto sauce. If you’re really feeling domestic, you can serve this with our Easy Homemade Rolls, our Caprese Salad, and our Famous Marshmallow Brownies for dessert! In a large mixing bowl, combine pasta, chicken, milk, mozzarella cheese, baby spinach, diced tomatoes, alfredo sauce and pesto. Mix until well combined. Spread mixture into a 9x13-inch baking pan sprayed with nonstick cooking spray. 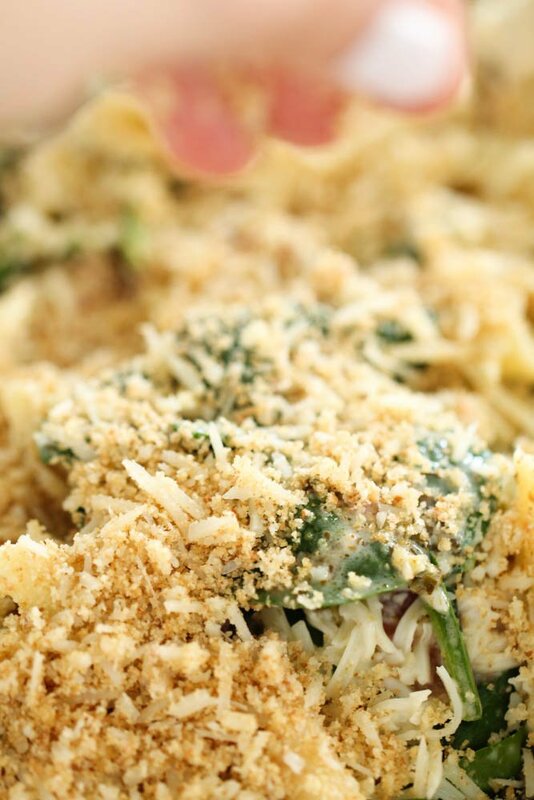 In a small mixing bowl, combine bread crumbs, parmesan cheese and olive oil. Sprinkle crumb mixture on top of casserole. Bake for 35-40 minutes, or until crumb topping is golden brown and casserole is heated through. In this video we’re making one of our favorite pesto recipes, Copycat Pesto Cavatappi. This makes a lot, can you freeze half for another meal? You can definitely freeze the other half for another meal. Be sure it's in an airtight container or freezer container covered well. I agree, this recipe does make a lot, however, we eat leftovers at our house. We cook one day and eat leftovers the next day. So I'm always looking for recipes that is conducive to that. The two things I will do different the next time is add more Alfredo sauce so it will be creamier. I will add more pesto sauce. We hardly noticed any pesto and we all love pesto. I will definitely make this recipe again. What's your favourite way of.cooking chicken For meals like this? We often just boil a whole bunch of chicken breasts at a time, then shred them. If you have an instant pot, you could cook them very fast.